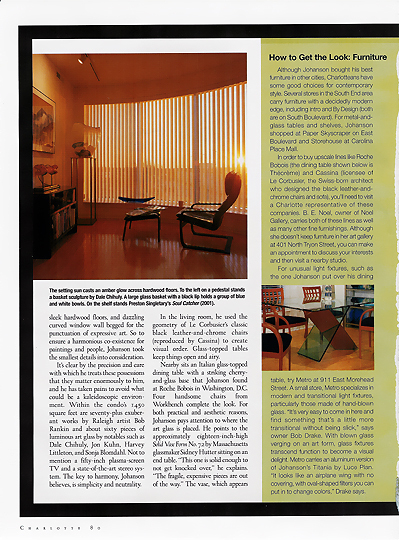 The folks at Charlotte Magazine were kind enough to feature my residence in a six-page article in the March 2003 issue of their magazine. 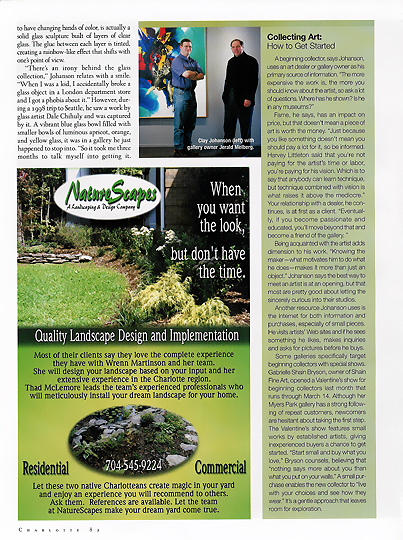 The focus of the article was not my art collection, but rather how to create a spacious, modern environment in less than 1500 square feet. Of course, since my residence is basically an art museum or gallery with a bedroom attached to it, it goes without saying that the works of art did become a featured part of the article. Laurie Prince, one of the editors at Charlotte Magazine, for being the driving force behind the article. Chris Edwards, for his amazing photography. After watching him at work for eight hours over two days, I have newfound respect for professional photographers. His images are the next best thing to actually being here. Jane Grau, for her excellent text. Jane interviewed me for almost two hours, and she did a very good job articulating what would have surely taken me ten times as many words had I written it myself. The folks at Bank of America's Gateway Village office complex, for allowing Chris and Laurie to take pictures from one of their break rooms (specifically, the external shot of my residence). Uptown. Judging by Clay Johanson's Gateway Plaza condo, with its slick, linear, high-contrast style, that's definitely what we should be calling our center city. Johanson, a thirty-something technical support professional, bought his first home in 1996 in Huntersville. However, the lengthy commute to Charlotteoften two hours a daywasn't how he wanted to spend his time. Meanwhile, the drive to make "downtown" Charlotte a great place to live as well as work was building up steam. Attractive mixed-use developments, with commercial establishments at street level and residential above, were being built in all quarters, so Johanson decided to trade his view of the blue water at Lake Norman for the blue sky over Ericsson Stadium. Now, from West Trade Street, Johanson has a twenty-minute drive to work near Arrowood Road. Once home, he has easy access to a typically urban lifestyle. He can leave his Audi TT in its parking spot and walk to concerts, restaurants, art galleries, coffee shops, the dry cleaner, a Panthers game, and the soon-to-be-built Harris Teeter supermarket. On the way, he'll cross paths with as mixed a population as you'll ever find in Charlotte, from young Johnson & Wales (the culinary university is also soon to be built) students to adventurous retirees enjoying their no-grass-to-mow flats. Even better, he had the opportunity to create an ideal home for his extensive collection of contemporary paintings and art glass. The condo's pure white surfaces, sleek hardwood floors, and dazzling curved window wall begged for the punctuation of expressive art. So to ensure a harmonious co-existence for paintings and people, Johanson took the smallest details into consideration. It's clear by the precision and care with which he treats these possessions that they matter enormously to him, and he has taken pains to avoid what could be a kaleidoscopic environment. 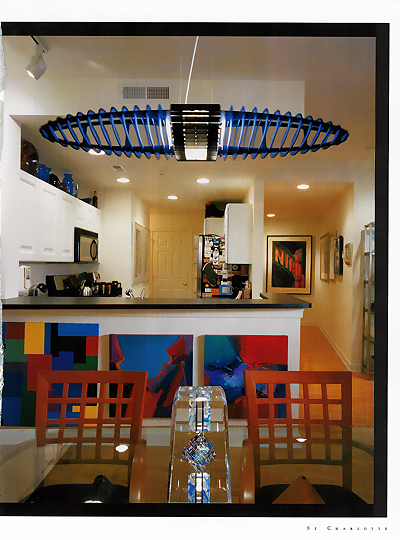 Within the condo's 1450 square feet are seventy-plus exuberant works by Raleigh artist Bob Rankin and about sixty pieces of luminous art glass by notables such as Dale Chihuly, Jon Kuhn, Harvey Littleton, and Sonja Blomdahl. Not to mention a fifty-inch plasma TV and a state-of-the-art stereo system. The key to harmony, Johanson believes, is simplicity and neutrality. In the living room, he used the geometry of Le Corbusier's classic black leather-and-chrome chairs (reproduced by Cassina) to create visual order. Glass-topped tables keep things open and airy. Nearby sits an Italian glass-topped dining table with a striking cherry-and-glass base that Johanson found at Roche Bobois in Washington, D.C. Four handsome chairs from Workbench complete the look. For both practical and aesthetic reasons, Johanson pays attention to where the art glass is placed. He points to the approximately eighteen-inch-high Solid Vase Form No. 72 by Massachusetts glassmaker Sidney Hutter sitting on an end table. "This one is solid enough to not get knocked over," he explains. "The fragile, expensive pieces are out of the way." The vase, which appears to have changing bands of color, is actually a solid glass sculpture built of layers of clear glass. The glue between each layer is tinted, creating a rainbow-like effect that shifts with one's point of view. "There's an irony behind the glass collection," Johanson relates with a smile. "When I was a kid, I accidentally broke a glass object in a London department store and I got a phobia about it." However, during a 1998 trip to Seattle, he saw a work by glass artist Dale Chihuly and was captured by it. A vibrant blue glass bowl filled with smaller bowls of luminous apricot, orange, and yellow glass, it was in a gallery he just happened to stop into. "So it took me three months to talk myself into getting it. I figured that would be the extent of my impulsiveness, but then I spent two hours in Charlotte with Jerald Melberg [he is the artist's Charlotte representative] and now here I am, surrounded by it." He has amassed a rainbow of treasures. Ruby, saffron, and ebony vases, orbs, and sculpture line up atop the kitchen cupboards. Against one white wall, a stainless steel shelving unit displays a variety of sizes and shapes in Johanson's favorite cobalt blue. Paintings are hung according to "the rules:" sixty inches above the floor on a center line; away from bathroom steam; only double-hung vertically if the frames are the same size. There's a story behind the paintings as well as the glass. "I started out decorating with good poster art because my parents took us to art museums all over the world and we brought them back as souvenirs. By coincidence, the day I met Bob Rankin was the day I got a settlement for a car accident. Down came the posters and up went original art. "Why him? I like his stuff and it's not expensive. You don't have to spend thousands of dollars to have a home filled with what you like. Collecting can be an addiction, but at least you get to keep what you're crazy about. It doesn't disappear after you enjoy it." Although Johanson bought his best furniture in other cities, Charlotteans have some good choices for contemporary style. Several stores in the South End area carry furniture with a decidedly modern edge, including Intro and By Design (both are on South Boulevard). 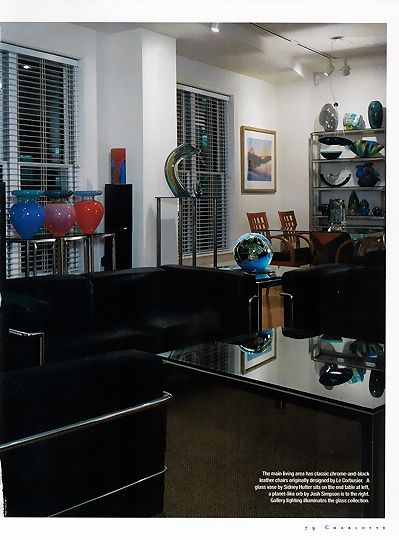 For metal-and-glass tables and shelves, Johanson shopped at Paper Skyscraper on East Boulevard and Storehouse at Carolina Place Mall. In order to buy upscale lines like Roche Bobois (the dining table shown below is Th�or�me) and Cassina (licensee of Le Corbusier, the Swiss-born architect who designed the black leather-and-chrome chairs and sofa), you'll need to visit a Charlotte representative of these companies. 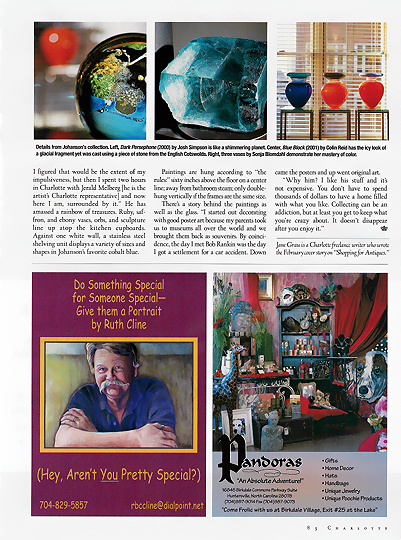 B. E. Noel, owner of Noel Gallery, carries both of these lines as well as many other fine furnishings. Although she doesn't keep furniture in her art gallery at 401 North Tryon Street, you can make an appointment to discuss your interests and then visit a nearby studio. For unusual light fixtures, such as the one Johanson put over his dining table, try Metro at 911 East Morehead Street. 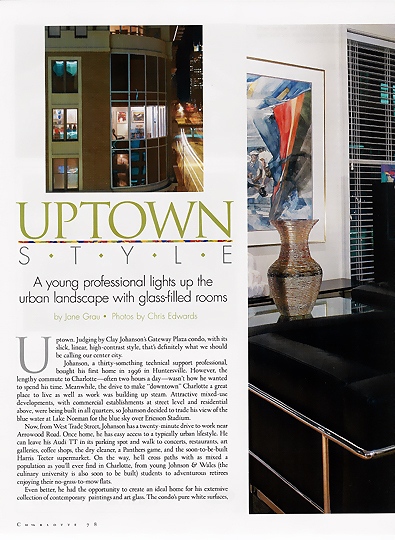 A small store, Metro specializes in modern and transitional light fixtures, particularly those made of hand-blown glass. "It's very easy to come in here and find something that's a little more transitional without being slick," says owner Bob Drake. With blown glass verging on an art form, glass fixtures transcend function to become a visual delight. Metro carries an aluminum version of Johanson's Titania by Luce Plan. "It looks like an airplane wing with no covering, with oval-shaped filters you can put in to change colors," Drake says. A beginning collector, says Johanson, uses an art dealer or gallery owner as his primary source of information. "The more expensive the work is, the more you should know about the artist, so ask a lot of questions. Where has he shown? Is he in any museums?" Fame, he says, has an impact on price, but that doesn't mean a piece of art is worth the money. "Just because you like something doesn't mean you should pay a lot for it, so be informed. Harvey Littleton said that you're not paying for the artist's time or labor, you're paying for his vision. Which is to say that anybody can learn technique, but technique combined with vision is what raises it above the mediocre." Your relationship with a dealer, he continues, is at first as a client. "Eventually, if you become passionate and educated, you'll move beyond that and become a friend of the gallery." Being acquainted with the artist adds dimension to his work. "Knowing the makerwhat motivates him to do what he doesmakes it more than just an object." Johanson says the best way to meet an artist is at an opening, but that most are pretty good about letting the sincerely curious into their studios. Another resource Johanson uses is the Internet for both information and purchases, especially of small pieces. He visits artists' Web sites and if he sees something he likes, makes inquiries and asks for pictures before he buys. Some galleries specifically target beginning collectors with special shows. Gabrielle Shain Bryson, owner of Shain Fine Art, opened a Valentine's show for beginning collectors last month that runs through March 14. Although her Myers Park gallery has a strong following of repeat customers, newcomers are hesitant about taking the first step. The Valentine's show features small works by established artists, giving inexperienced buyers a chance to get started. "Start small and buy what you love," Bryson counsels, believing that "nothing says more about you than what you put on your walls." A small purchase enables the new collector to "live with your choices and see how they wear." It's a gentle approach that leaves room for exploration. 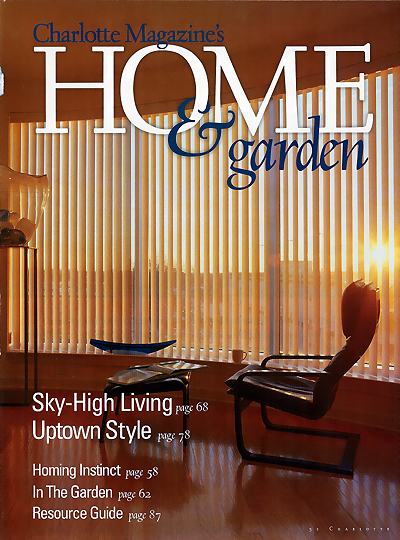 Scroll down to view additional magazine pages.